Srinagar: “Our own youth has to be won over with a healing touch” was the much touted remark parroted again today by Mehbooba Mufti, the Jammu and Kashmir Chief Minister heading the PDP-BJP coalition government in the trouble-torn State bordering Pakistan. In J&K normal life has been disrupted – especially in Srinagar and a couple of adjoining districts- by the radicalised youth, secessionist elements and terrorists from across the border. 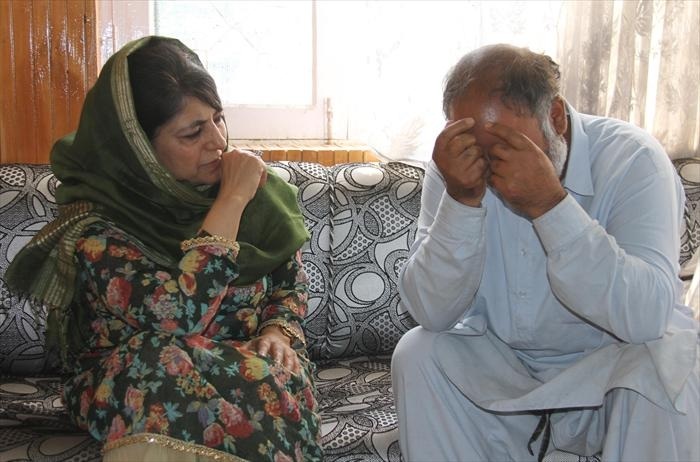 Mehbooba Mufti underscored the need for a “healing touch” to win over the radicalised youth. She was presiding over a meeting of the Unified Command Headquarters. The meeting was called to review the security situation and increasing violence in the Kashmir valley in recent weeks. Prominent among those present at the meeting were Deputy Chief Minister Nirmal Singh, State Chief Secretary B R Sharma, Principal Secretary Home R K Goyal, Director General of Police S P Vaid, GoC-in-C of Northern Command Lt Gen Devraj Anbu, Army Commanders posted in the state, Senior CRPF and BSF officers and Divisional Commissioners. This is not the first time that Mehbooba Mufti has expressed such lofty sentiments with regard to the stone-pelters who have continued to hold the State to ransom. In fact this has become a pet jargon with her as she never misses any opportunity to fill her speech with these sentiments. Those in knowledgeable circles are asking -besides visiting families of those who have died recently during violence and anti-national protests at places like Anantnag and Kupwara and launching the ambitious food entitlement scheme, what concrete steps have been taken by the chief minister on the ground to win the hearts and ensure the radicalised youth return to the national mainstream. In the just concluded election for the Srinagar Parliamentary seat, the nation was witness to endless street violence directed against the security forces. People are asking where was the might of the State and what was done by the authorities overseeing and spearheading the election process to guarantee fair and peaceful polls. Another big question is where is all the money coming from to sustain the radicalised section of the population that is on the warpath and refuses to engage in any economic activity -especially after demonetisation of high denomination currency notes to stop money laundering and drive out counterfeit notes that were being used by the terrorists to carry out their activities in Jammu and Kashmir and other parts of the country.